In the mythology of ancient Egypt, at death the deceased's heart would be weighed against the ‘Ma'at,' the feather of Truth. If the heart, filled with inequity, tipped the scales out of balance, the judged one would be ferried across the river Styx to the Underworld to serve the sentence of divine Justice. 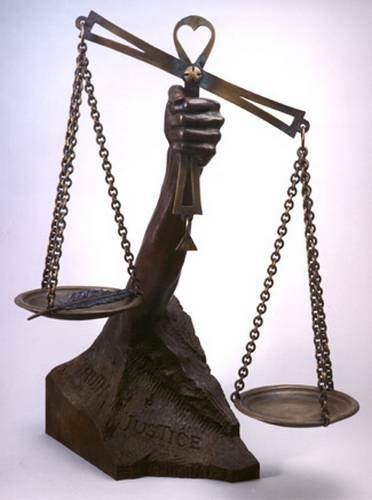 Today, the scales of social justice are tipped seriously askew and responsibility rests upon those within the judicial system to correct the imbalance before the final judgment is decided. The arm of Justice, chiseled from a solid block of stone, rests on a base with one side of 9 inches, symbolizing the presumed finely cut and measured judgments of the Supreme Court Justices. The other side of 12 inches reflects the ideal of the rough-hewn verdicts of a jury of the common people. Connecting and watching over both is the Divine Judgment reflected by the perfectly polished 7-inch back. While the heart above the scales denotes that all judgment must be tempered with mercy, the all-seeing Eye of God, suspended beneath, reminds us all of the admonition that "As we judge, so shall we be judged."